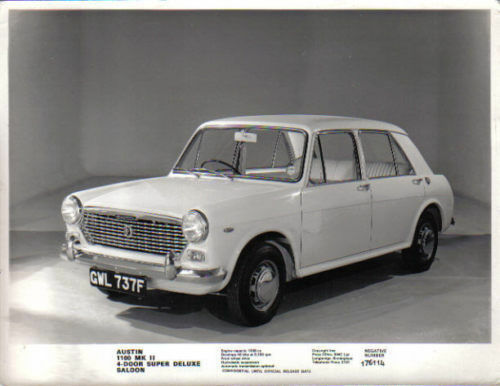 A sherry-drinking mouse up a ladder; a pale blue Austin whizzing around Andalucia; beautiful Spanish women – and it’s all from 1967, courtesy of British Pathé, which recently put 85,000 clips on YouTube. In this film there’s barely a a word of commentary that isn’t interesting or entertaining. Watch until the end – it’s fabulous; a snapshot of the area’s past. But how much has changed? Below, we’ve detailed parts of the film. Mouse over the film when there’s a bit you’re interested in and check with its corresponding time, eg [02:25]. For once, the links open in a new window. [00:15] – Piconegro (ship). Piconegro was a cargo ship built in Bilbao in 1955. The ship is now ‘dead’. [00:50] – Sherry consumption. As stated, in the 1960s the 70 per cent of sherry was exported to the UK but, apart from the record-producing year of 1979, consumption has fallen greatly. Now, Spain itself is the largest consumer, although the UK isn’t far behind. Even since 2002, UK consumption is down 45 per cent. [01:35] – Jerez de la Frontera. 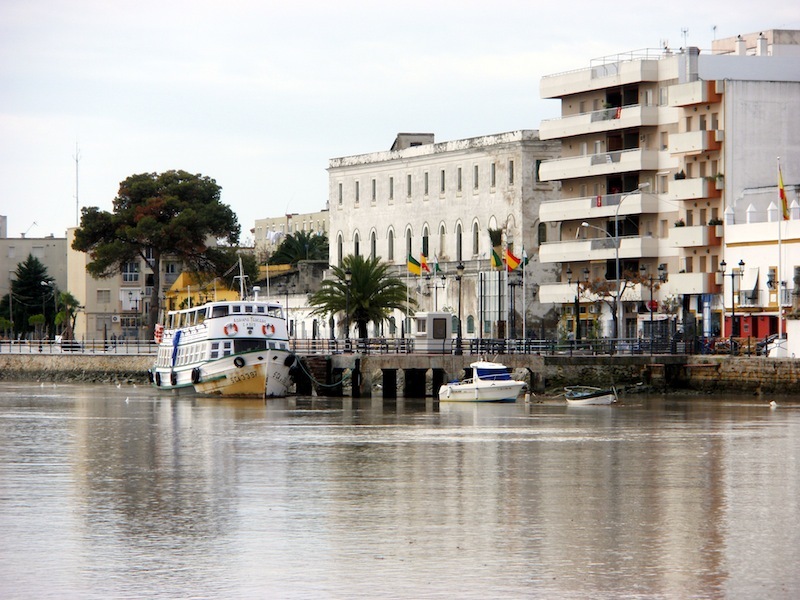 Jerez de la Frontera is in the province of Cadiz. [01:55] – Entering Arcos de la Frontera. Plaza del Cabildo as it is today – pretty much the same. The castle is now a parador (a hotel owned and managed by the Spanish government). Here’s a post about our stay in La Casa Grande in Arcos de la Frontera. [02:25] Restaurant Molinera and paddle-boat Mississippi. The restaurant is still going strong but the boat, Mississippi, less so. This website details its recent, and sad, history. The boat remains on the lake, unloved and inaccessible among the weeds and slimy water. The aerial photo below (right) shows the pier, or thereabouts, that the presenters walk up. The founder of Molinera, Eduardo León de Manjón, took his last trip on her before his ashes were scattered on the lake. [04:55] Bodega designed by Gustav Eiffel. Perhaps not quite as towering an achievement, here’s the place today, Real Bodega de la Concha, built in 1869. [05:45] Casks dedicated to famous visitors. Looking at this website, the bodega was/is Williams & Humbert. Here are some photos showing the same casks Queen Mary and the Duke of Windsor signed almost 100 years ago – with footballers of Real Madrid. 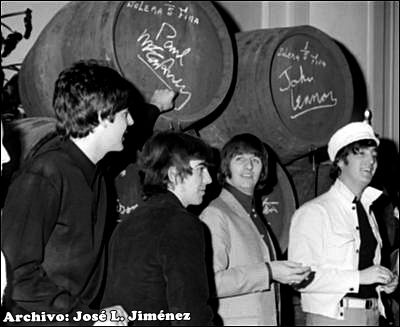 The Beatles signed, and posed in front of, some Jerez barrels, but not actually in situ. The barrels were sent to Madrid where they were performing in 1965. [07:35] – El Cordobés. From stealing chickens as a kid to Spain’s highest paid matador by the end of the 1960s, Manuel Benítez Pérez – El Cordobés (The Cordovan) – is still around. Famously, while making his first appearance at Las Ventas, the bullring of Madrid, he almost became a cropper when gored by the bull. It was live on TV too. Whatever you think of bullfighting, here’s an interview with him (in Spanish) and some interesting footage. We’re unsure which bullring features in the film, it doesn’t look like Jerez. If anyone knows, please tell us.